It's kitsch, but the Eurovision song contest — culminating in Lisbon this weekend — also confronts Brussels politics. The French entry, for example, is called 'Mercy' and is all about the refugee crisis, inspired by a baby born on a migrant ship in the Mediterranean. But after Russia was barred last year, commentators say things aren't so political this time around. "The tensions between Russia and Ukraine are not really being articulated in the contest. 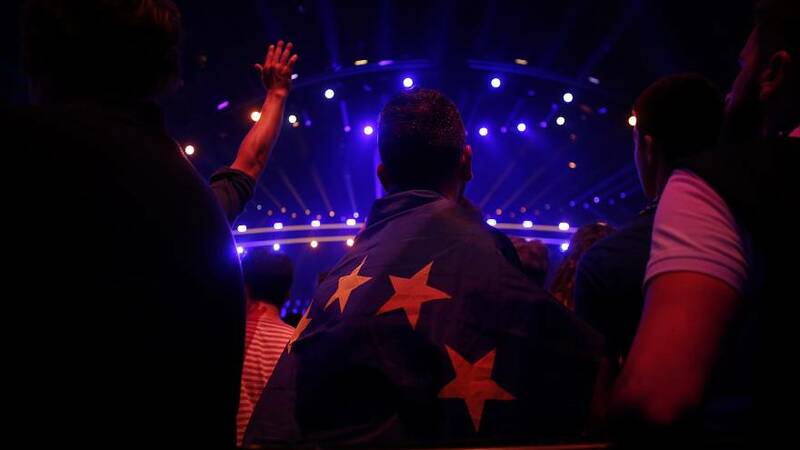 Portugal itself is a state that has a positive image in the world, good relations with its neighbours, so there aren't too many wars to be played out on the Eurovision stage," said Dean Vuletic, an historian at Vienna University. EU decision-makers and diplomats have been entertained by Eurovision for years. Belgium's Sandra Kim performed in Brussels after winning in 1986, but hopes of a 2018 win have been dashed. Euronews' Damon Embling reported: "Belgium may well have crashed out of this year's Eurovision, but it's not dampening spirits here in Brussels." Wael Afifi is organising a Eurovision party at a Brussels hotel. "Politics is an aspect and meeting people together regardless of where they come from or what they believe in, it's just like the human factor, people are socialising you know. The idea behind the event that we are organising is people just forget what is happening," he said. Italy's also taking on a political theme this year, its song focusing on war and terrorism. But should politics come into play? One man in Brussels commented: "Most of the people who are participating in the Eurovision song contest, they have the right to vote, they vote for politicians, so they should also use their voice there and on stage." A woman added: "I didn't see much of the politics in the songs. The songs are too silly to have politics, many of them." France and Israel are among the favourites tipped to win this year's Eurovision. The final is on Saturday night.